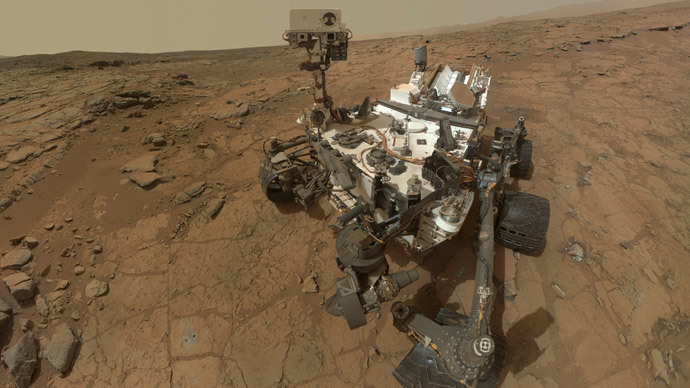 Mars has given us new clues about the possibilities of past life on the planet after NASA’s Curiosity rover found nitrates embedded in its rock. The elements are known on Earth as one of the key precursors to life. Scientists have long searched for organic carbon molecules, which are still the number one candidate for proof of life, as they are produced by living organisms here on Earth. But nitrogen is just as essential, according to NASA geochemist and team member Jennifer Stern. The Monday study, published in the journal Proceedings of the National Academy of Sciences, talks of Mars harboring a special form of nitrogen conducive to microbial life, if any existed. The microbes would have been able to use the nitrogen to form key building blocks of life, such as amino acids. Nitrogen also makes up the nucleobases that later form DNA and RNA. Curiosity hides a wealth of onboard instruments beneath the hood to help it analyze the various dust and pebbles it finds. Its SAM (sample analysis on Mars) instrument looked at three samples found near Curiosity’s landing site: aeolian and mudstone deposits found in three separate locations close to each other – Rocknest, Cumberland and John Klein. SAM then heated up the materials in its oven-like enclosure, analyzing the resulting vapors, which were found to contain significant amounts of nitric oxide. Mistakes could have been made if the samples weren’t sufficiently isolated from their surroundings, so the team had to account for chemical contamination to make sure nothing was adding itself to the gases. The results continued to display amounts of nitrogen significant enough for microbial life to form in the driest regions of our own home. Although most nitrates on earth are produced by living things, scientists are still not sure what the source was on Mars. The team at NASA believes there could have been a “thermal shock,” such as a weather event or an asteroid impact that could have given rise to that particular synthesis. Further tests will help determine “whether this process is still happening today at all,” or whether it used to happen under different climatic conditions on Mars than those that exist today, Stern said. The new discovery should come as a welcome development to those who romanticize Mars and our search for alien life. A few days ago it was discovered that Mars One – the much lauded upcoming one-way mission to Mars – was marred in controversy and suspected of being a big lie.